The Consular Club of Ho Chi Minh City, whose members are from a number of diplomatic missions in Ho Chi Minh City, will launch its 25th International Charity Bazaar on November 3, 2018 at the Adora Center Convention Centre, 431 Hoang Van Thu Street, Ward 4, Tan Binh District. Representative of the club said the event is scheduled to start at 9:30 am and run until 3:00 pm on the same day. This year’s bazaar is considered as a special occasion for the Consular Club as it also is to celebrate the 25 years of friendship between Vietnam and the Consular Missions in HCMC which aim to provide humanitarian aid to disadvantaged people in Vietnam. The Consular Club focuses especially on aid for orphans, the disabled and the elderly and minority groups. Last year’s bazaar raised more than US$ 70,000 and with this money the club supported 12 projects including education scholarships for children and young adults, treatment for blindness in infants, infrastructures to deliver fresh water and the creation of an aquaponics system to create a sustainable food sources for an orphanage. This year’s entry tickets costs 100,000 VND for adults, and children under 6 accompanied by an adult can enter free of charge. 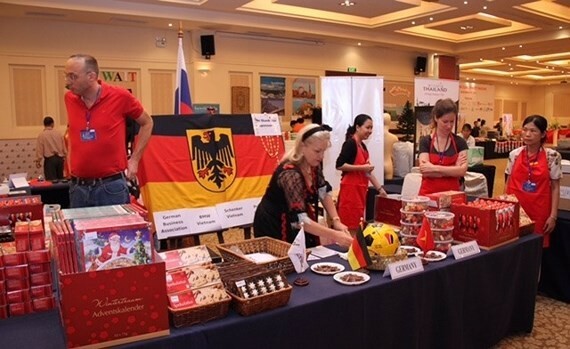 In addition to the chance to buy a wide range of international goods and food, visitors can also purchase tickets in the popular Raffle Draw. Raffle tickets are available for 50,000 VND each, and prizes include premium necklaces from our Platinum Sponsor – Swarovski, airline tickets, vouchers for stays at deluxe resorts and hotels in many famous locations throughout Vietnam, spa packages, lunch or dinner vouchers in luxury restaurants in Saigon and much more. Every prize in the raffle is worth at least US$100.